The last time Warner Bros/DC Comics released a documentary was in 2010. Ryan Reynolds narrated Secret Origin: The Story of DC Comics which looked at the 75 year history of the publisher, and it was rather enjoyable, and accessible, with plenty of interviews with comic creators, and some great art. The next focus is an interesting one, as it shines the spotlight on the multitude of bad guys and gals. Most people know the heroes such as Superman, Batman, Wonder Woman, Green Lantern, etc so to look at their enemies is an interesting idea, and comes at a good time, with the cinematic Bane and Catwoman recently seen, and Zod and Faora from June’s Man of Steel film, plus next month’s release of the Injustice: Gods Among Us video game. Official details below. 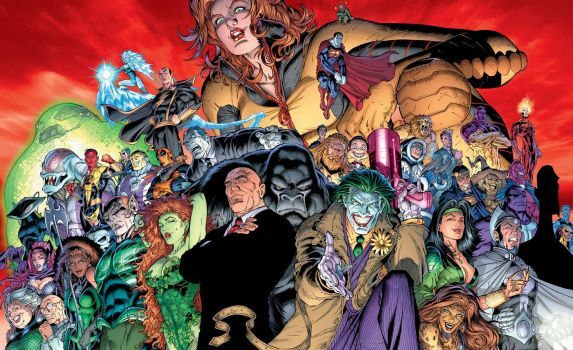 The Joker, Bane, Deathstroke, Darkseid and Lex Luthor — the scariest and most menacing villains in DC Comics’ universe — take center stage in a brand new full-length documentary from Warner Bros. Home Entertainment (WBHE) and DC Entertainment (DCE). The joint announcement was made today by WBHE and DCE. Christopher Lee, who has played the villain more times than almost any other actor, will provide his unique voice as narrator. His roles in more than 200 films include star turns as Dracula, the Mummy and Frankenstein’s monster in Hammer horror classics, Count Dooku in Star Wars, and Saruman in The Lord of the Rings trilogy andThe Hobbit films.